Finally a finish from my October 2016 win. Thank you everyone for your contribution. Apologies for the photo, it was taken outside on a sunny day. This is such a happy quilt. I actually love the way that the blocks don’t completely match up perfectly. It gives it a modern feel. It also shows the possibility that more than one person had a hand in making it. Wonderful. Congrats on a beautiful win and finish. Another pretty quilt finish – two in the same day is probably a record! I like the way the flowers look – nice and scrappy but a bit realistic, too. 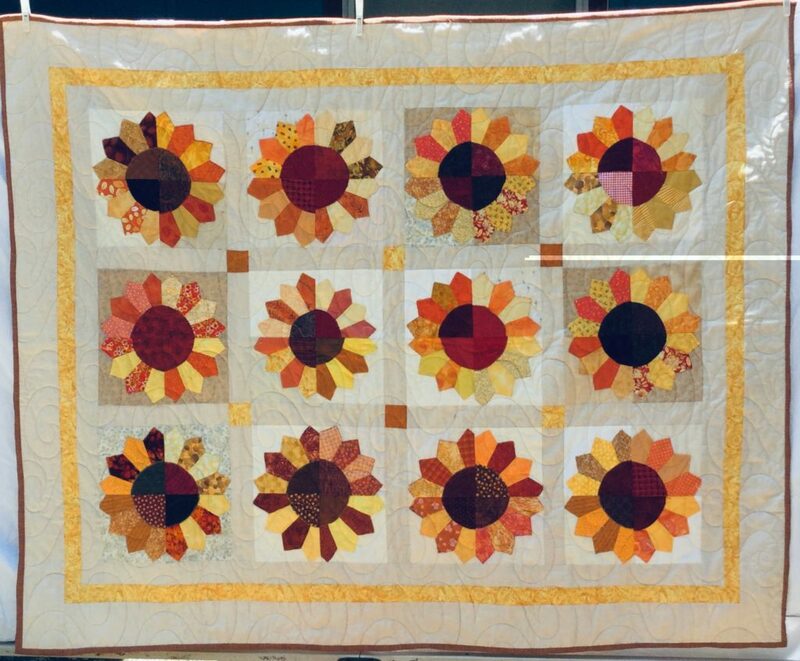 Another great finish … you’ve been a busy quilter, Margaret. I spy a couple of my blocks! It’s always fun to see where they turn up. Congrats on another beauty. I love Sunflowers and grow a lot of them.